U.S. Treasury Secretary Steven Mnuchin has met with Saudi Arabia's embattled crown prince, Mohammed bin Salman. The meeting took place as the crown prince faces growing international criticism over the killing of Saudi writer Jamal Kashoggi at the kingdom's consulate in Istanbul. Saudi Arabia has said Kashoggi, a critic of the Saudi royal family, was killed Oct. 2 in a "fistfight" with officials sent to encourage him to return to the kingdom. Turkish media and officials say the 59-year-old Washington Post columnist was killed and dismembered by a 15-man Saudi hit squad. Canadian Prime Minister Justin Trudeau has called an emergency meeting with Cabinet ministers and senior government officials to discuss what he called the "horrible murder" of writer Jamal Khashoggi in the Saudi Consulate in Istanbul. Trudeau's office said Monday the Saudi explanations lack "consistency and credibility." Trudeau called an "Incident Response Group meeting," which his office says is convened during a national crisis or during incidents elsewhere that have major implications for Canada. Trudeau said in Parliament he wouldn't hesitate to freeze arms export permits but didn't say if Canada would cancel a 2014 multi-billion-dollar deal to supply light-armored vehicles to the Saudis. Canada's previous government made the deal. Saudi Arabia had a diplomatic dispute with Canada this summer over the Saudi arrest of women's rights activists. President Donald Trump says he's not satisfied with the explanations he's heard about the death of Saudi journalist Jamal Khashoggi. Saudi Arabia said Khashoggi was killed in a "fistfight" with officials sent to encourage him to return to the kingdom. Turkish media and officials say the 59-year-old Washington Post columnist was killed and dismembered by a 15-man Saudi hit squad. Trump said he's spoken with Saudi Crown Prince Mohammed bin Salman since Khashoggi's death. Speaking to reporters Monday on the South Lawn, Trump said: "I am not satisfied with what I've heard" regarding Khashoggi's death. A rights group is calling on the United States, Turkey and other nations to reject what it says is an attempt by Saudi Arabia to "whitewash" the killing of Saudi dissident writer Jamal Khashoggi. In a statement on Monday, New York-based Human Rights Watch said Saudi Arabia's claim that Khashoggi was killed in a fistfight at the Saudi Consulate in Istanbul appeared to be an attempt to "insulate Crown Prince Mohammed bin Salman from further scrutiny and to prevent full accountability" for the journalist's death. Michael Page, the deputy Middle East director at Human Rights Watch, said "demotions of senior officials as scapegoats" would not exonerate the crown prince. 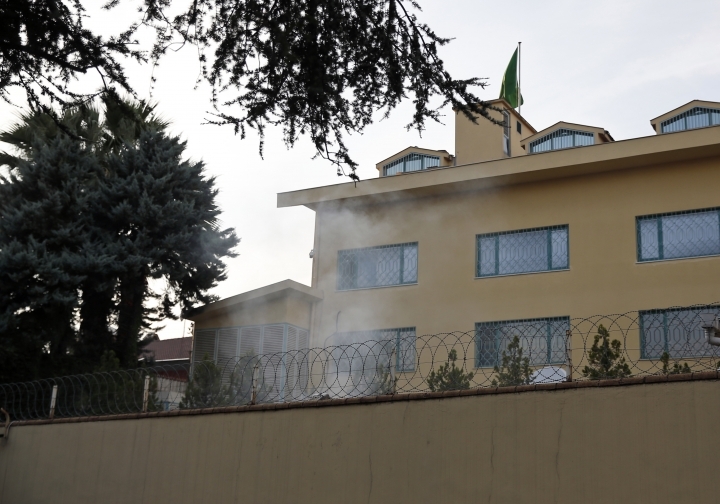 A video shared by a television channel that is close to Turkey's government appears to show three men burning documents in the Saudi Consulate's backyard a day after Saudi writer Jamal Khashoggi was killed. A Haber news channel said the surveillance camera video — allegedly showing "evidence" being burned inside a drum — was recorded on Oct. 3. Saudi Arabia announced Saturday that Khashoggi died as a result of a "fistfight" at the Consulate. That claim was met with international skepticism and allegations of a cover-up to absolve the 33-year-old crown prince of direct responsibility. A Pakistani rights group is objecting to Prime Minister Imran Khan's decision to attend a Saudi investment conference in the wake of the killing of Jamal Khashoggi at the Saudi Consulate in Istanbul. The Independent Human Rights Commission said Monday that the prime minister's decision "ignored the sentiments" of many people and the international outcry over the Saudi writer's death. It says the government should have taken a clearer stand on Khashoggi's killing, and that "business interests" should not undermine the "right to dissent" and freedom of expression. Several international companies and leading investors decided not to participate in the Saudi investment conference in the wake of Khashoggi's killing. The conference, which begins Tuesday, is intended to rally world support behind Crown Prince Mohammed bin Salman's economic reforms. French Foreign Minister Jean-Yves Le Drian has asked that Saudi Arabia provide a complete account of journalist Jamal Khashoggi's death and hinted at possible punitive measures. Speaking Monday during a joint press conference with his Tunisian counterpart Khemaies Jhinaoui, Le Drian said "what happened is extremely serious. It is a murder against a journalist, and moreover, a murder that was not confessed at the start." Le Drian said France is waiting for the results of the investigations into the journalist's death before taking "necessary measures, if required." Le Drian did not elaborate on the measures France could implement. Jhinaoui condemned the murder as "unacceptable," but praised Saudi Arabia for its decision to open a "thorough investigation" and insisted the country "should not be targeted with the aim of threatening its security and stability." Le Drian said France is asking for "the utmost clarity on this murder, which is not the case today." Turkish President Recep Tayyip Erdogan's spokesman says Saudi Arabia remains an important "brotherly and friendly country" and that Turkey does not want ties with Riyadh to be harmed. He said: "The approach of our president from the beginning has been extremely clear: that nothing concerning this incident remains a secret." He added that "Saudi Arabia is an important country for us. It is a brotherly and friendly country, and of course we would not want this to be harmed." Kalin added: "Rather than making it an issue between the two countries, there has been a determination for the incident to be brought to light." Last Thursday, Mnuchin announced that he would not attend an investment conference scheduled to be held in Saudi Arabia from Oct. 23 to Oct. 25. Mnuchin's announcement came after a White House meeting with President Donald Trump to discuss the investigation into the death of journalist Jamal Khashoggi. Italy's prime minister says he is awaiting "credible answers" about the killing of Saudi journalist Jamal Khashoggi. Premier Giuseppe Conte told foreign reporters in Rome on Monday that Italy takes the case very seriously, "but we would like to have all the elements before evaluating them with our international partners." Saudi Arabia finally acknowledged the writer's death early Saturday in what it described as a "fistfight" at its consulate in Istanbul. The German government said Riyadh's explanation of Khashoggi's death is insufficient and called for a common European position on the matter. Asked whether Italy was satisfied with the Saudi explanation, Conte said: "We are still waiting for credible answers to be provided because this is a really worrisome case. ... This case cannot be closed without satisfying answers." The Future Investment Initiative, hosted by Crown Prince Mohammed bin Salman, was intended to showcase the kingdom's economic reforms, but several big-name investors and companies have withdrawn in the outcry over the killing of Saudi journalist Jamal Khashoggi. The site's home page displayed the message "404 Not Found" on Monday. Twitter users meanwhile posted screen grabs of the conference's home page showing the crown prince standing over a kneeling Khashoggi with a flaming sword. A black flag that is used by Islamist militants is unfurled in the background. Saudi Arabia said Saturday that Khashoggi was killed in a "fistfight" inside the Saudi Consulate in Istanbul on Oct. 2. Turkish media and officials say the 59-year-old Washington Post columnist was attacked by a 15-man Saudi team that cut off his fingers and decapitated him. Analysts say it's unlikely such an operation could be carried out without the knowledge of the crown prince, who oversees the country's security services. A large police van arrived at the car park in Istanbul's Sultangazi district on Monday. News reports say the car was left there two weeks ago. Investigators looking into the disappearance of Saudi journalist Jamal Khashoggi had last week searched other consulate vehicles, along with the consulate building and the consul general's residence. Saudi Arabia said Saturday that Khashoggi was killed in a "fistfight" inside the consulate. Turkish media and officials say the 59-year-old Washington Post columnist was attacked by a 15-man Saudi team that cut off his fingers and decapitated him. Turkey's state-run news agency says authorities have found a vehicle belonging to the Saudi Consulate at an underground car park in Istanbul. Anadolu Agency says Monday the vehicle with diplomatic license plates was discovered at the car park in Istanbul's Sultangazi neighborhood, some 15 kilometers (9 miles) away from the consulate building, where Saudi journalist Jamal Khashoggi was killed. 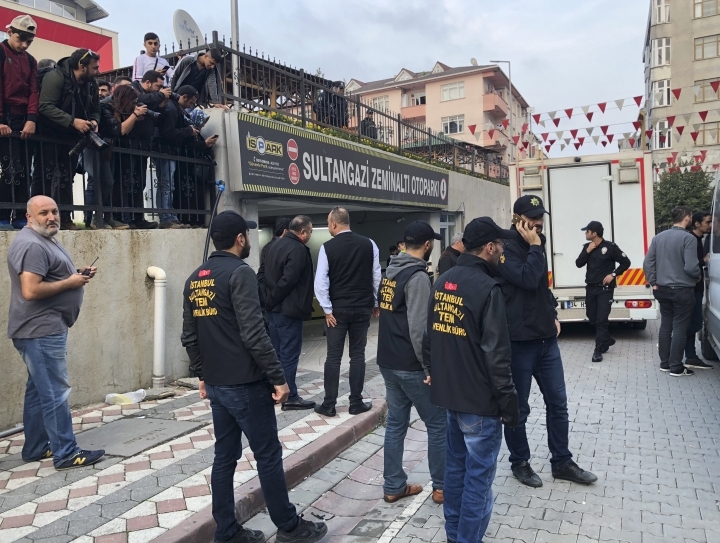 The agency says authorities need to obtain permission from the consulate as well as the Istanbul chief prosecutor's office before searching the vehicle. Other Consulate vehicles were searched last week, along with the consulate building and the consul general's residence. Saudi Arabia acknowledged Khashoggi's death on Saturday, saying he was killed in a "fistfight" inside the consulate. Turkish media and officials say the 59-year-old Washington Post columnist was attacked by a 15-man Saudi team that cut off his fingers and decapitated him. A senior Turkish official says surveillance footage showing a man wearing Saudi journalist Jamal Khashoggi's clothes leaving the Saudi Consulate in Istanbul indicates that his death was a pre-planned killing and that efforts were made to cover it up. Speaking to reporters on Monday, Omer Celik, spokesman for Turkey's ruling party, denied as "immoral" suggestions that Turkey was delaying announcing the findings of its investigation into Khashoggi's death because it was engaged in an alleged "bargaining" process with Saudi Arabia. Celik said: "We are faced with a situation in which it was a brutally planned (killing) and efforts were made to cover it up." The official said Turkey was leading a careful investigation to ensure that "nobody is falsely accused" and that the incident is not covered up. "God willing the results will be brought into the open, those responsible will be punished and no one will dare think of carrying out such a thing again." Saudi authorities said last weekend that Khashoggi was killed in a "fistfight" with Saudi officials at the consulate on Oct. 2, after initially insisting they knew nothing of his whereabouts. The chief executive of German industrial conglomerate Siemens says he won't be going to this week's investment conference in Saudi Arabia. He's the latest to pull out of the event in the aftermath of the killing of Saudi journalist Jamal Khashoggi who was slain at the kingdom's consulate in Istanbul. Joe Kaeser wrote in a LinkedIn post Monday that he had "received hundreds, if not thousands, of emails and social media posts urging me not to attend the Future Investment Initiative Conference." Kaeser said Siemens has been "a reliable partner" to Saudi Arabia for decades "but for now, the truth must be found and justice must be served" in the case of Khashoggi. He stressed that "it's not a decision against the kingdom or its people." He defended leaving his decision until late, and said that "blaming companies for keeping the lines of communication open and for protecting people and jobs is simply cutting it too short." Newly leaked surveillance footage from the killing of Jamal Khashoggi appears to show a man walking around in the writer's clothes in Istanbul after his killing. The French presidency says France's President Emmanuel Macron and President Donald Trump shared their concerns about the circumstances that led to the death of Saudi journalist Jamal Khashoggi. The statement, calling the journalist's death "tragic," says the two presidents had a telephone call on Sunday, without providing more details. Turkish president Recep Tayyip Erdogan has said that details of Khashoggi's killing will be revealed in a speech that Erdogan will give in parliament on Tuesday. Indonesia's president is "deeply concerned" about the killing of journalist Jamal Khashoggi at the Saudi Consulate in Istanbul and wants a transparent investigation. President Joko Widodo met with Saudi Arabia's Foreign Minister Adel al-Jubeir on Monday at the presidential palace in the West Java city of Bogor. Widodo's concerns were relayed by Indonesia's foreign minister following the meeting. The minister, Retno Marsudi, told reporters that "the president is deeply concerned with the Khashoggi case and Indonesia hopes that the ongoing investigation will be transparent and meticulous." Al-Jubeir is on a two-day visit to Indonesia and has a separate meeting with Retno on Tuesday. Retno said the visit was scheduled after the Saudi monarch visited Indonesia, the world's most populous Muslim-majority nation, in March last year. The officials say Recep Tayyip Erdogan and Donald Trump agreed during their call late on Sunday that the journalist's case "should be brought to light in all aspects." Saudi authorities have said Khashoggi died in a fight with Saudi officials at the kingdom's consulate in Istanbul on Oct. 2. Turkish officials and reports have suggested that a team of Saudi agents was sent to assassinate him. The report by Yeni Safak on Monday cited no source for the information. However, pro-government newspapers have been leaking information about Khashoggi's killing, apparently with the help of Turkish security forces. The newspaper says the calls went to the head of the crown prince's office, as well as a number in the United States. Saudi Arabia did not immediately respond to a request for comment Monday. The kingdom acknowledged Khashoggi's death on Saturday, saying he was killed in a "fistfight." Turkish media and officials meanwhile say the 59-year-old Washington Post columnist was attacked by a 15-man Saudi team that cut off his fingers and decapitated him. Chancellor Angela Merkel's government has said Riyadh's explanation of Khashoggi's death is insufficient. Economy Minister Peter Altmaier underlined Monday its position that "we won't at this point approve any further arms exports because we want to know what happened." Altmaier told ZDF television that a joint EU position is needed "because only if all European countries agree, this will make an impression on the government in Riyadh." He said "it will have no positive consequences if we, as we are doing, currently don't pursue our arms exports if at the same time other countries fill this gap." Saudi Arabia's Crown Prince Mohammed bin Salman has called the son of Jamal Khashoggi, the journalist killed at the Saudi Consulate in Istanbul by officials that allegedly included a member of the royal's entourage. King Salman likewise called Khashoggi's son, Salah. That's according to statements published early Monday by the state-run Saudi Press Agency. The statements said both King Salman and Prince Mohammed "expressed his condolences"
For weeks, Saudi Arabia insisted the Washington Post contributor had left the consulate. The kingdom finally acknowledged his death early Saturday in what it described as a "fistfight."